I am beyond honored and humbled to share a very special success story this week. I encourage everyone to take just a few minutes to read about Kathy’s journey. If this doesn’t motivate you and bring a tear to your eye, I don’t know what will! I am grateful to have been by Kathy’s side (although she lives clear across the country) the last few months. When she took her first class, she didn’t make it through the first 5 minutes. Now she’s rocking 4-5 classes a week! This girl is something special! 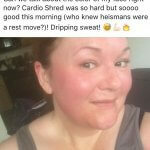 At the VFit Studio we love sharing our member’s Success stories. We receive them often, and every story is one to celebrate. Health is not about a short term plan or quick fix. It is a complete recalculation of your life (digging into the emotional side of things as well) and finding the program and team that you can STICK with for the long haul. We know our team at VFit is special – we come from every walk of life, but all share the same common goals TOGETHER. We lift each other up through the tough times, we push each other to dig just a little bit deeper and we have a lot of fun along the way. “I don’t say this lightly, but VFit Studio has literally changed my life. When a friend introduced me to VFit several months ago, I was coming off of a rough several years of my life, which included serious illness, seven spine surgeries, divorce, loss, a lot of depression and anxiety. I had gained over 80 lbs in the past 5 years and was struggling to maintain any sense of self-esteem. I truly believed that my health was too far gone and was a lost cause. The VFit team was immediately so welcoming, they helped me to identify if I was READY to commit myself to real life change and the “whys” behind what I wanted for my life and my health. After a lot of soul-searching, I jumped in head first and have been surprising myself ever since. VFit’s community keeps me motivated and upbeat, helps me to connect to my gratitude and is there for pep talks when I get frustrated with my progress. The workouts are so convenient and fit in with my schedule rather than me having to work around them. I was initially worried about the workouts being too hard for me since I suffer from chronic back pain and am extremely reconditioned, but they are short enough that I can schedule several a week without overdoing it or hurting myself. They are also so effective that my body is already changing in major, noticeable ways after only a couple of months. I can always work at my own pace, and the instructors always have several modifications for each move so that everyone is challenged at their own level — and my pain has actually decreased! The instructors are knowledgeable, supportive and aren’t harsh drill sergeants — something I definitely appreciate. They take the time to get to know you, your goals and are personally invested — I really feel like part of a big family now.